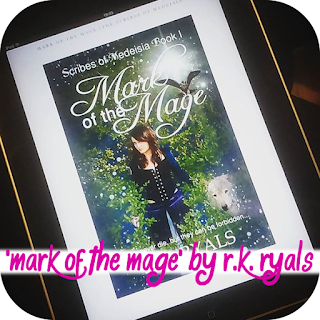 Today i'm bringing you a review of 'Mark of the Mage' by R.K Ryals. This is the first book in the Scribes of Merdesia series with there being four in total. First off I have to say it is very beautifully written. Each word paints a very vivid picture of the wonderful world of Miss Drastona (Stone) Consta-Mayria. Born illegitimately into this world she seeks solitude in a world of books and parchment. Very quickly we find out that the world of Medeisia is changing around. It has other plans for Stone with marriage seen as the only option to save her from a life of unknown pearl. But her step-mother has other ideas by announcing the use of magic, which is forbidden by rule of the King, resulting the death of Stone's very much loved nurse maid. From that moment on Stone's life is forever changed. Branded with a tattoo for the forbidden practise of scriber, her tattoo echoes her life with her inkwell that was her sanctuary now cracked. Every word written flows so freely through the book leading you to very much be taken in by the writing. The scenery is described as the story goes, without the stopping and starting effect that many books have. Along the way you meet characters who you love and hate with the flip of a coin as you feel Drastonas pain and suffering. With Magic, dragons, tree whispers and a wolf, this book is sure to take you in to the descriptive heart tugging world. -* The book is avalible for purchase on amazon*-. If you haven't seen the previous wednesday book reviews be sure to click here. This sounds lovely... I haven't read a fantasy novel for quite some time but it might be time address that as it used to be my favourite genre! It's not my sort of book but you sell it really well. Thinking it may be the dragons that put me off.